This stunning new centre, boasting nine floors and nearly 40,000sqft of space opens in November, bringing a new wave of exciting workspace to Woking. The centre boasts a number of useful amenities, including elegant meeting rooms, 24 hour access, printing and kitchen facilities, as well as fast WiFi. It is also perfectly located to get the best out of Woking, including being directly opposite the train station, which allows for access to London within 25 minutes. Such a central location means there are a vast array of eateries and drinking holes within the immediate area. Overlooking the pedestrianised Commercial Way, this new co-working serviced office is situated in the heart of Woking. In addition to the open co-working space there are also three private offices available to cater for 4, 5 or 9 desks. London Waterloo is within easy reach, as Woking Railway Station is just two minutes walk away, and the M25 and A3 are close by, making this the perfect location for those commuting by car. This centre is located on a new business park, close to the town centre of Woking and also well placed for the railway station and services to London Waterloo. Local amenities include a supermarket, as well as on-site amenities such as a management team, parking spaces, 24-hour access with a key card system and reception services. Woking town centre offers a range of places to eat and drink, and accommodation. This Ripley-based centre is based in a historic Grade II listed building and offers potential tenants the choice of either furnished or unfurnished space. Workspace comes in a range of sizes - from 123sqft up to 523sqft. The centre has recently undergone a fantastic refurbishment and comes fully carpeted, with fast WiFi, a VOIP system and many other amenities. 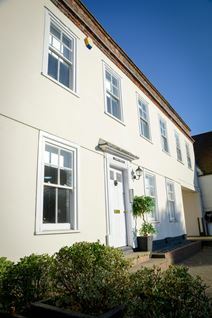 The centre is close to both the A3 and M25, as well as being not too far from both Heathrow and Gatwick airports.